Sometimes Mom has a bad day. Sometimes the twins are sick and fussing all morning. Sometimes it's hard just pulling lunch together without someone crying and tugging on legs. Sometimes Mom has been up for hours during the night holding sobbing toddlers, trying to comfort them to no avail. And sometimes, as a result, you get a mad banana in your lunch. Complete with horns. He is accompanied by a big pickle, a corn dog, chips (a rarity), skewers of fruit, and some mustard for dipping. This post is linked to Muffin Tin Monday which you can find HERE. Have you entered my giveaway yet for environmentally friendly green cleaning products? I totally love that you added horns. It sounds like it was a tough night. It is so hard to make lunch with only one leg to move around with. This just completely made me giggle! I love the mad banana! Sorry you had a rough night! Hello, I come by your blog via another Blogging Buddie, and I just wanted to stop by and introduce my self.. My name is Karen, co~author of http://heartofthehome-blog.blogspot.com/ my friend Missy and I recently started a new womens ministry , God has put on our hearts to encourage women, wives, mothers, etc...So I hope you will get a chance to swing by and visit Heart of the Home.. and say Hi.. I enjoyed reading your post and look forward to becoming Blogging Buddies with you as well..
Love the mad banana! Thanks for giving us all a giggle after your rotten night! A great lunch, love the banana. I hope your twins get better soon. Hope everyone is feeling good ASAP, but thank you for the AM giggle! lol... that actually looks pretty good! I'm laughing at the banana! I think the mad banana is funny! Sorry you had such a bad night Lisa. 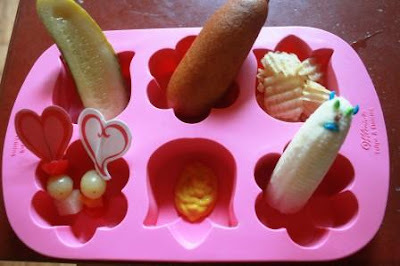 Good that you can put it aside to still put together a cute lunch. Ha! The mad banana is precious. And what a sweet little lunch presentation. I am totally feeling that Mad Banana! How funny! But sorry you had such a bad night! How are the twins now? That banana is wild, what ARE those blue things made of? Lisa! How adaorable!!! I had never heard of Muffin Tin Monday. I am sooooo trying ths with my husband - complete with the mad banana. Love the angry banana. Hope tonight brings some rest and tomorrow brings a more peaceful day! Oh this made me laugh out loud! Way to have fun anyway! I don't mean to laugh at your rough time with the kids, but that's funny! I know what you need!!!! he doesn't look mad. he looks a little sick. also. i like the pickle. A mad banana can be just the thing! If someone made me that - I'd love it! Love bananas! Love the mad banana! LOL Thanks for stopping by my blog. I also love the Blue Ridge Mountains. We live not far from the bottom stretch of it. We ride it as often as possible!